When I’m not cooking archival recipes, I eat a lot of greens. Kale, spinach, chard, green beans, peas, escarole, cabbage, broccoli, or lettuce feature in most of my meals. But many of the vegetable recipes in the manuscripts we’ve consulted are for preserving vegetables for future use. 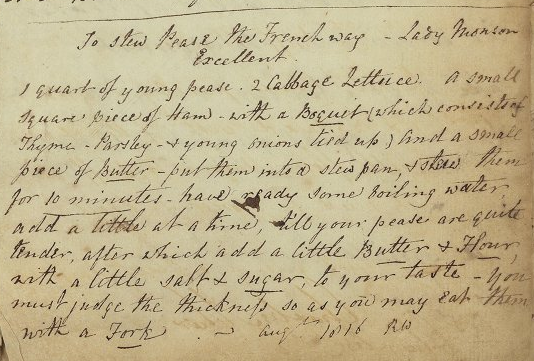 We baked peas into a tart and pickled tomatoes, but we’ve featured fewer fresh vegetable dishes, like herb soup and this recipe “To stew Pease the French Way.” Alyssa and I were both excited to find this recipe for peas and cabbage in MS. Codex 644, a manuscript connected to the Frankland family that we’ve turned to for “Cheap Soupe” and “Oven Cakes.” We were also inspired by the note, “Excellent,” under the title. If you’re looking for a new way to eat your greens, a recipe to use up that partial head of cabbage lingering in your fridge, or even searching for a last-minute Thanksgiving side, read on! The bundle of herbs and smoky meat pair beautifully with the sweet peas and the savory cabbage. The addition of a roux thickens the cooking liquid into a delicious sauce. The source of the recipe, “Lady Monson” may be Lady Anne Monson (1726-1776). Monson traveled to India soon after marrying Colonel George Monson of Lincolnshire in 1757 and spent her last decades living in Calcutta and traveling South Asia collecting botanical specimens. It’s tempting to link the Monsons and the Franklands given their shared history in India and South Asia, but I have not been able to confirm the connection. Brown ham or bacon in butter. Add cabbage, peas, herb bouquet, water, salt, and pepper. Cook for 5 minutes. Blend 2 T butter, softened and flour, add slowly to the vegetable mix. Cook for 5 more minutes until the vegetables are cooked, but haven’t lost all their crunch. This is a delicious way to eat your peas. We chopped up the scallion and parsley to garnish our servings and I liked the bites that included the herbs best. You could easily leave out the smoky meat to make a vegetarian version of this dish. Smoked salt or a sprinkle of paprika might add that savory note to a vegetarian version. We also think this would taste delicious with roast turkey, potatoes, and stuffing, which is why we’re sharing this recipe with you today. Let us know how it turns out, whenever it happens to grace your table! This looks really good! Thanks for sharing the recipe. Delicious indeed! I made it tonight to accompany grilled venison with a juniper, thyme, and black pepper rub. I think it’ll go into our standard rotation. Hmm, I tried to post a picture, but it didn’t go through. Maybe an actual link will work? peas! Wonderful! Thank you for sharing the photo and letting us know. That venison preparation sounds excellent, too. What an interesting way to spend your time in the kitchen. With the increasing interest in Community Sustainable Agriculture ventures, old recipes should be a natural add-on to the veggie boxes. That’s a great idea! Thanks for reading. Mother used to cook peas with lettuce. Incidentally English pod peas are not usually as tender or sweet as those we buy in the US. I find American veggies to be sweeter – carrots, cabbage, etc – which I really appreciate; only chard, which I love, tastes the same to me. Thanks for posting this recipe. Fake version: If you are using canned peas (don’t deny it, you do) pour the juice into a pan and reduce it with dried onion flakes and the herbs of your choice. When most of the water is cooked off, stir in a big gob of butter (no substitutes–the butter thickens it slightly) and the peas. Give it a minute for the peas to heat through. Sorry.